Aiden Chambers, in his book The Reading Environment, also speaks of the importance of an enabling adult crafting time and a routine for students to anticipate meaningful book conversations. These Book Chat prompts are designed with meaningful conversations in mind. Most importantly, these prompts allow every child the opportunity to chat about the very book they are reading, or the very book you are reading as a class. Be the enabling adult who brings rich conversational experiences to your learners. Start Book Chats with the book/s you read together as a class. Then lead students into chatting about their books with a partner – turn and talk for 90 seconds each. Get your students talking about their reading and watch them grow in understanding and engagement. After reading, turn and talk - 60-90 seconds per child. The amazing thing is how easy and cheap it is to implement Book Chats! I used to have my Yrs 3-6 students read to parent helpers on a weekly basis. This then extended to students using the Book Chat prompt of the week to include a chat to the helper about their book. This was an experience that every child, and every parent helper relished. We simply do not do enough of it. Some of the time enabling adults spend supporting students in your school could be spent with students chatting to them about their reading. 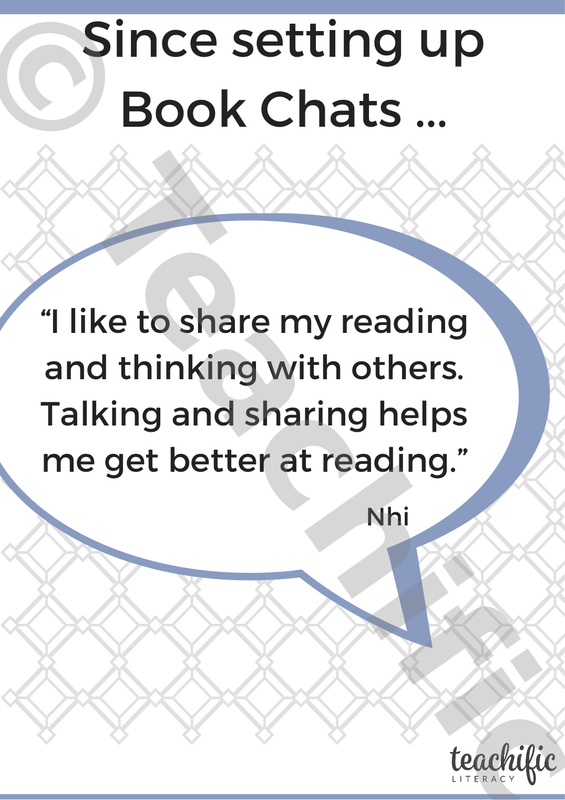 Nhi says it well: 'I like sharing my reading and thinking with others. Talking and sharing helps me get better at reading.’ Yr 6. Research might tell us, but children can vouch for it. ACELY1789: Use interaction skills including initiating topics, making positive statements and voicing disagreement in an appropriate manner, speaking clearly and varying tone, volume and pace appropriately. ACELY1792: Use interaction skills, including active listening behaviours and communicate in a clear, coherent manner using a variety of everyday and learned vocabulary and appropriate tone, pace, pitch and volume. ACELY1688: Use interaction skills such as acknowledging another’s point of view and linking students’ response to the topic, using familiar and new vocabulary and a range of vocal effects such as tone, pace, pitch and volume to speak clearly and coherently. ACELY1699: Clarify understanding of content as it unfolds in formal and informal situations, connecting ideas to students’ own experiences and present and justify a point of view. ACELY1709: Participate in and contribute to discussions, clarifying and interrogating ideas, developing and supporting arguments, sharing and evaluating information, experiences and opinions.